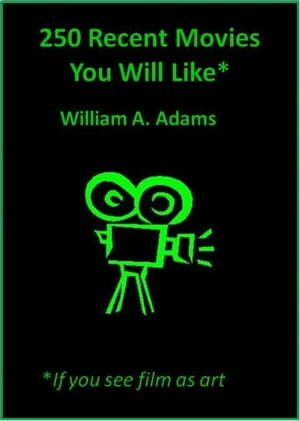 Collins Booksellers - 250 Recent Movies You Will Like If You See Film as Art by William A. Adams, 9780983717744. Buy this book online. Short reviews of 250 recent, feature-length movies are listed. All the films are available in the U.S., most of them on DVD or streaming. The reviews are five hundred words or less, just enough to give you a sense of what the movie is about and if you would like it. The movies are artistic and thoughtful, which does not necessarily mean “serious.” There are plenty of humor, horror, romance, animation, musicals, documentaries, and kids’ movies. A: Is it artistic? Is it good looking, well-executed, well-acted, well-crafted, or innovative? Does it advance the art form of movie making in some way? B: Is it thoughtful? A thoughtful movie has something to say, makes a comment on the world, offers insight into the human condition, challenges the status quo, puts a new twist on old idea, rethinks history, raises questions, highlights injustice, points out absurdity. My reviews are opinionated, but evidence-based, which means I give reasons for my opinions, so you can estimate for yourself if I am being fair and reasonable. Some of these movies are not mainstream box office hits, but if you appreciate film as an art form, you will find a lot to like.